Top: Empty machines during a strike at Shipman & Baker ladies suits and coats, 500 Seventh Avenue, 1951. Library of Congress. Bottom left: Plan of 250 West 39th Street. Courtesy of Avery Architectural and Fine Arts Library, Columbia University in the City of New York. 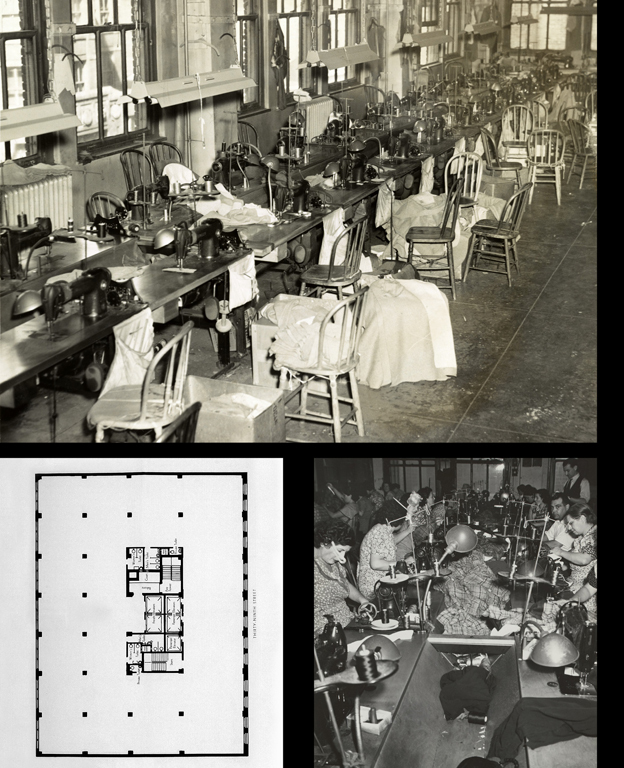 Bottom right: Interior of a garment factory, 1938. NYC Department of Records, Municipal Archives. The interiors of all of the garment factory and showroom buildings were planned in a similar manner. The only designed space was the lobby, modest in the factory lofts, and more spacious and ornate in showroom buildings. The upper floors of every building were open spaces that could be subdivided by a single tenant as needed or sub-divided for multiple tenants. Passenger and freight elevators were strategically placed for flexibility of floor plans. In many buildings, workers were forbidden to use the lobby and passenger elevators. Many freight areas had small lunch counters for these workers. The factories were planned to maximize every inch of space and to take advantage of the light and ventilation from large windows. Most had a small office near the main entrance for the contractor, a bookkeeper, and any other office staff. The "operators"- the sewing workers-sat on wooden chairs arrayed along both sides of wooden tables, generally set close to the windows. Overhead lighting was supplemented by an individual lamp at each machine. Long tables for cutting fabric were placed in the center of the space, while off to the side were pressing machines and space for preparing finished garments for shipment. Electric outlets were generally on the floors for ease of access, while sprinklers ran overhead.